It’s been called the greatest mind control device known to humanity and amazingly it’s the one addiction that when truly broken can most change your life forever. Yes, that’s how bad this problem of mind control has become. You can cut the degree of mind control deception with a knife, it’s so thick. Freeing oneself from such a deep level of deception is a mental freedom you can only truly understand if you have experienced it yourself. Consider the prospects of going from a full state of being mesmerized in a controlled environment to one of freedom. Mental freedom and spiritual freedom that is. Perhaps these are the two most important freedoms. Physical freedom on the other hand, is usually the first to go and the one we’d like to think we will fight for and defend. It (the physical freedom) is the one they always threaten to take away. This physical freedom is the image of freedom we all dream about for what good is freedom of speech if it’s at a prison or concentration camp? No question the values and virtues of physical freedom speak for themselves, but what about mental freedom? How do we measure this? Is it really all subjective? Who can answer this? This much I know, television is a prison for your mind. When you are watching TV, especially every day, your ability to connect to your real life is fogged; the line between reality and fiction become blurred. The young generation knows about this real well, they live in the matrix every day, subjected to the impulses that come with being young. As they should enjoy their youth, I cast no stones at youth who won’t consider the problems of the world. A part of me empathizes with a youth who would rather not know how bad the world really is. Empathy only goes so far however. Ultimately ‘I understand’ gives way to ‘no I’m serious’ and ‘hey I really need you to understand this’. Realizing what is really happening should induce an ‘oh my god’ out of you, at the very least. If only you could connect with the reality of the suffering that humanity has endured throughout history. That’s right, if you could actually experience reality through the eyes of those who have had close family and friends murdered by war and propaganda, this would significantly impact your view about life. So why are so many especially in America so disconnected from the reality of what I speak? Television. How then can anything so bad for you be so legal? Only after being mentally cleansed from the TV addiction can you truly appreciate this question. Television is quietly the most important tool for the success of the globalist new world order plans. It’s the direct channel of communication they have set up to push their messages across to the masses in order to see their agenda through. This television ‘power cable’ which sends signals directly to your mind, is real and works similar to the cable lines that run all across America. We see the lines all over the country. Cable, Wi-Fi, telephone and fiber-optic lines. It’s a network of communication lines that coat the country. These lines deliver television and other signals directly into everyone’s homes and now we are observing the multidimensional effect of this whole phenomenon. How can so many electronic radio wave signals not affect the mind in a deleterious manner? And how about the degree of mind-control it has on those hard-wired to it? This is why disconnecting your television and throwing it away is one of the most powerful ways that you can change your life forever. Yes forever and manually, no power needed. Right now every single person in America has the power to manually turn the TV off and find out or rediscover who you really are. Turn off the electronic signal that has you fully mentally controlled. The TV has found a parking space in your mind. If the majority of Americans could find the courage to turn off that mental parking space and start their life anew, the global government minions and their politician mouthpieces would lose their audience instantaneously. Imagine! With no audience, how can one complete a plan? Sounds crazy? Wait till enough people have had enough. 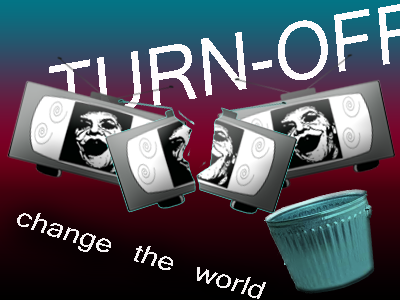 Though it may or may not ever happen it is factually true that if everyone right now turned off their TV we would have a world-wide revolution never before seen. Imagine humanity focused on fixing what is wrong. What if we could finally unseat the criminal politicians who are running the show? Actually it’s been said that all that is needed to induce true change is for 1% of the people to wake up. If this is true then think of how close this ‘TV turning off’ effect is to coming true. Spread the word. Turn your TV off and do without it. It’s easy and it’s fun. It really is. After a few months you’ll look back and you won’t believe you watched TV in the past. It’s an addiction you usually never go back to and when you are around someone who watches TV you may feel uncomfortable with the signal alone. You’ll understand the phenomenon a lot more once you cross that line.